Sandhya tells commissioner! 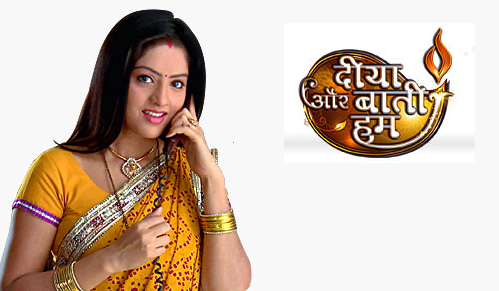 Diya Aur Baati Hum 24th June 2016 Episode Written Updates :- Sandhya and Bhabo went to the temple to urge Pandit that they want to serve people with the Maha Prashad. Pandit Ji says that nobody can compete Suraj but they can’t neglect the fact that happened today. Sandhya urges him to give them a chance it was their first mistake just forgive them and give them a chance. Dipen came there and manipulates their mind. He says that Suraj is not able to make the Prashad on his own so that no one can take the responsibility. His parents are aged now and they can’t fulfill the responsibility. He asks him to give the chance to him this time. Chavi takes the card of him and in the flashback. Chavi accepted Dipen’s offer also she tells him about Suraj’s strength and weakness. He gives her the installment amount for the information. She praised Dipen in front of Pandit. He urges him to give the chance as he qualifies all the requirements. Sandhya and Bhabo also ask to give the chance to him but he says that he cannot take the risk. Therefore, he gave the chance to Dipen as there is nobody who can take his place. Vikram says that he will give all the expenses of the house and family as he failed to fulfill his responsibilities but Meena tries to stop him. He ignores. Sandhya saw the picture of Ardhnareshwar. He asks the painter meaning of it, he states that both male and female are equal and in need they can replace each other. Sandhya tells the same to Pandit Ji and requests him to give them a chance as she will take the charge. Chavi criticizes her but she ignores that and heads towards. She promises to prepare the Prashad with all the purity and taste. The pandit held that they will compete and the one who wins, get the chance to prepare the Prashad. Sandhya asks the commissioner that she resigned her duty as nobody is there to attend her duty at home but so many can handle her job.